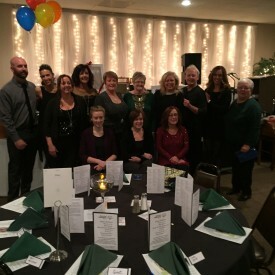 The 20th Annual Kick Off the Holidays auction was held on Nov. 21 at the Elks Lodge in Dixon. This event featured a silent auction, live auction, live music and delicious hors d’oeuvres buffet. Many fantastic items were featured in the auctions and the weather could not keep the crowd away! 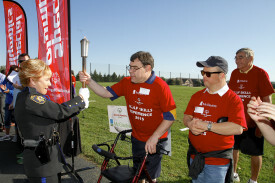 In total, over $60,000 was raised for the athletes of Special Olympics Illinois. Many thanks go out to the sponsors of this event. This fundraiser would not be possible without the commitment of the Holiday Auction Committee who volunteered their time and efforts to ensure its success. The Committee consists of Eligh Barton, Kristin Buckley, Carol Crafton, Debbie Kelly, Judy Young, Lisa Kennay, Janet Kipping, Leslie Nelson, Christine Scheffler, Kalah Carson, Lyndsey Kelly and Trent Geiger. The 2015 McGladrey Golf Experience was held Sept. 15 at Aldeen Practice Center in Rockford. This event allows athletes to practice the different skills involved in golf while also serving as a fundraiser for SOILL Northwestern/Area 1. The event utilizes volunteers contacted by the local McGladrey office in Rockford. Athletes are able to practice drives, chipping, bunker shots, long putts, short putts and iron shots. All the athletes who participated had a great time and are looking forward to the experience next year! We would like to offer a big thank you to McGladrey, which is now RSM-US, and to Mary Price, who is retiring at the end of the year, for their continued support and dedication to the athletes of Northwestern/Area 1. The North Sectional Bowling Tournament was held on Saturday, Nov. 7. This event was held at The Cherry Bowl in Rockford. Area qualifiers competed for the chance to go to the State Bowling Tournament in Peoria. More than 150 bowlers competed in ramp, singles, doubles and team events. Congratulations to all the bowlers who advanced and everyone for a fantastic event! The Young Professionals Board (YPB) of Special Olympics Illinois hosted its 5th annual fundraising event to benefit the athletes in the SOILL Chicago/Area 3 program. 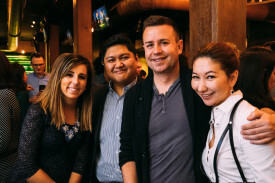 “Thanks-for-Giving,” a wine and beer tasting event, was held Nov. 12 at Public House in Chicago. More than 120 guests enjoyed the evening which included tasting of many delicious varieties of wine, beer and champagne. Abundant hors d’oeuvres and desserts were available throughout the night. The event was planned by a committee of YPB volunteers and was chaired by Alia Zander. Additional committee members include Erica Behm, Jess Bollow, Jenna DiDiana, Kayla Elsworth, Katie Joyce, Katie Ward, Mae Rodovich, Connor Rusnak, Abby Sher and Melissa Smoler. Generous donors contributed to a raffle and silent auction which included gift cards for dinner, theater, and hotel accommodations, sports tickets and destination packages. The event earned more than $14,000 to benefit Chicago/Area 3. 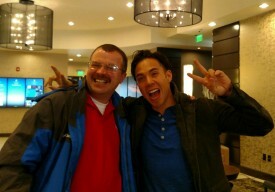 Illinois athlete Chad Gatlin of Peoria was one of eight Special Olympics athletes to receive individual instruction from U.S. Olympian and Special Olympics Global Ambassador Apolo Ohno at the 2nd Annual Apolo Ohno Invitational in Salt Lake City, Utah. The Nov. 13 Invitational featured eight of the world’s top Special Olympics speed skating athletes at the Olympic Oval. Gatlin and the others raced in short-track speed skating men’s and women’s team relay, 500-meter and 1,000-meter races. Get the latest Heartland/Area 6 news by reading the December Area newsletter. Most individuals cannot say that they have committed more than 20 years of volunteer service to one organization, but that’s not the case for Mabel Campbell. In fact, Mabel has been volunteering as a Special Olympics coach for 28 years now, having started in 1987 as an assistant coach for the Olney Rebels Special Olympics team. As an assistant coach, Mabel learned sports rules, techniques for training Special Olympics athletes, and team development strategies, such that she was able to take over as the head coach in 1992. Get the latest East Central/Area 9 news by reading the December Area newsletter. At a Special Olympics basketball tournament at Quincy University Dec. 6, every basket made was met with thunderous applause from the QU student athletes that volunteered for the event. I was there to support them and give them tips and congratulate them on anything they did,” said QU men’s basketball player Grant Meyer. Athletes from all over central Illinois put their skills to the test in a winner-take-all tournament in Pepsi Arena. Though friends and family were in attendance, the athletes’ loudest supporters were the student-athletes that call QU home.